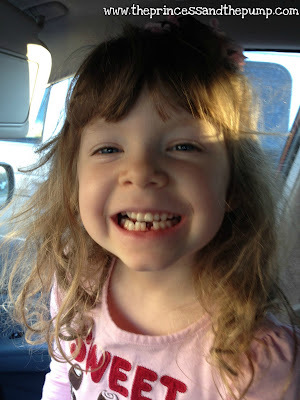 Last Thursday night, right before gymnastics, Sweetpea lost her very first tooth! We usually stop and pick up a snack/dinner for her because she always starving after school and needs some energy! So there she was taking a bite out of a french fry when she says, "OUCH!" I was quite surprised! I really didn't think the tooth was that loose! She must have bit just right... she reached in and pulled it out. Blood. There was blood. Not a lot. But enough to make her a little scared. After a few rinses and looks in the mirror to see how super cool she looked, she was thrilled and excitedly talking about the tooth fairy! Of course, I had prebolused dinner. Of course, she refused to eat another bite because it felt funny. Of course this happened on bite two. A little juice did the trick and she happily went to flip around the bars and balance on the beam. Yes, the Tooth Fairy did visit! (Even though Sweets had stated a week or so earlier that she knew the Tooth Fairy was really your Mom.) 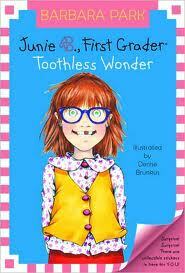 She had to make a run to Target but she picked up a Hello Kitty toothbrush and a Junie B. Jones Tootheless Wonder book! 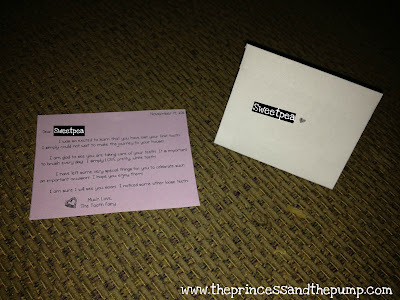 She also wrote Sweets a tiny little letter! It's hard to tell but the envelope is about 2 inches by 2 inches! I was amazed at how small that little tooth was. I remember when it first came in. Seems like just last week, at times. But as I looked at that tooth, I saw something else. Did you know that there are stem cells in teeth? Did you know that there are places you can send teeth to have them collect the stem cells in case you ever need to use it? I haven't done a lot of research on this. Honestly, I thought I had more time. Almost three years ago when Sweets was diagnosed losing teeth seemed like something as far off as college. I found a place called Store-A-Tooth that specializes in extracting stem cells from teeth. There's a lot of info there that I haven't had time to thoroughly read. You can check it out HERE. We didn't bank cord blood when Sweets was born. We thought about it. But it was so much money. And I thought the chances of needing it were so slim. And I wasn't sure about trusting the process... So we didn't. Then three years and 57 days later, Sweetpea was diagnosed with type 1 diabetes. And when I read that some researchers were using cord blood to make new cells and using it in the process of finding a cure... my heart sank. I have never felt that Sweets got diabetes because I did something wrong. Or because I didn't do something I should have. Now that we are three years in to life with this disease and I've read more about possible sources for a cure, I don't know. I don't know where the cure will come from. But I do know that it does me no good to beat myself up about a decision that I can't change today. I can't go back in time and save that blood. Not the first one. That one is mine. But maybe another one. Maybe. But that's ok. I've got 19 more chances to make up my mind! Don't forget to enter the TallyGear and Red Bench Designs Giveaway! Just click HERE for your chance at three amzing prizes!! 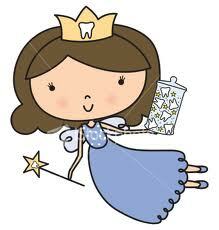 Yay, Tooth Fairy!! Way to go Sweets! Sweetpea looks so darn cute without her tooth! Thanks for the great information on Store-A-Tooth...definitely something to think about. Yay Sweets! Such a cute smile with that tooth missing!